Playing at The Hawth Theatre, Crawley on Sat 14 November, 7.45pm. Did you know that Crawley’s Irish community has played a leading role in a theatre show that’s gone from strength to strength touring the UK? Now, coming full circle, the acclaimed and much loved Journey to the Fifth Province will play at The Hawth Studio 7.45pm on Saturday 14 November, presented as a Crawley Fleadh event, sponsored by the Celtic and Irish Cultural Society. This is a funny, moving and thought provoking entertainment that crosses boundaries between theatre, music and storytelling. With actor Dónal Cox (ex-Abbey Theatre, RTÉ, BBC) and Celtic harper Harriet Earis (twice Harper of All Britain). The occasion will be a special one because it will complete a story – and a journey – begun in Crawley back in 2004. That year John Nolan, on behalf of CICS, invited Irish actor and writer Dónal Cox to bring a production to the first ever Crawley Fleadh. Dónal devised an entertainment in words and music with the title Come Sit By My Fire. His purpose was to entertain people but also, as he puts it, “to present something outside of the ordinary that would enable the audience to water their Irish roots in a deep and memorable way”. The script invited a number of Ireland’s world-renowned poets to join him around the fire, through the stories in their poems, and called for music to add its magic too. John introduced Dónal to the superb Irish trad group Siansa who were to play later that evening at the Fleadh. A musical selection was agreed and rehearsed. The chemistry was spot on! Dónal remembered that comment and began to reshape the script based on the audience’s feedback. Crawley had spoken – and “more of this” had to be shared with other Irish communities around the UK. It took a while before he was satisfied but what emerged was a new work entitled Journey to the Fifth Province. And – coming full circle in 2015 – this is the show that’s playing at The Hawth on Sat 14 November, 7.45pm. To fill in some more of the story, the show had its premier in 2011, before another packed audience, opening the first ever Irish Writers Festival in London. 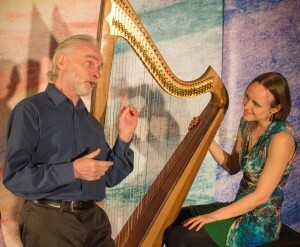 A new musical score was in the hands of renowned Celtic harpist Harriet Earis, a member of Síansa that earlier night in Crawley. They recreated the traditional duo of speaker and harper that’s been at the heart of Gaelic culture since ancient times. With the show ready to share, Fifth Province Productions secured funding from Arts Council England and private sponsor The Clancy Group to take it to Irish centres around the country. In a fulfilling and rewarding chapter in UK Irish cultural life, Journey to the Fifth Province has toured to 30 venues including centres where marginalised Irish seniors could attend and enjoy this unique cultural event. Major UK Irish Festivals in Liverpool, Leeds and Tyneside have presented the show. The Irish Cultural Centre Hammersmith and London Irish Centre were sell-out nights – the latter in the presence of Irish Ambassador Dan Mulhall.